Home › Loans › Peerform Review 2019 – Need A Loan But Got Low Credit? 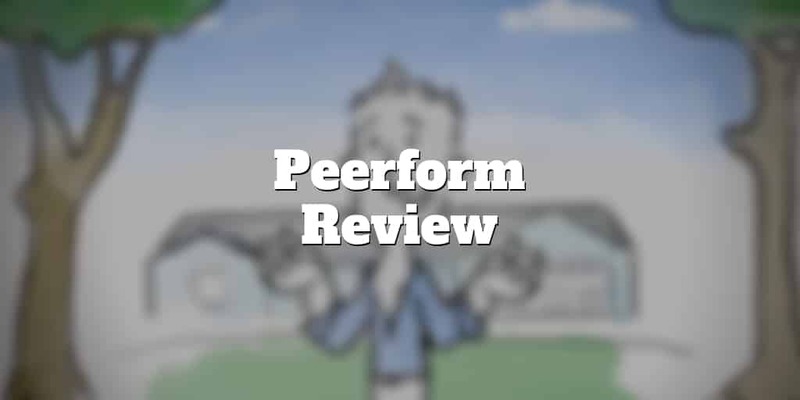 Peerform Review 2019 – Need A Loan But Got Low Credit? Peerform is a marketplace lending platform that connects borrowers and lenders. If you are paying off credit card debt or other loans at high interest rates, Peerform is worth a look because it is designed for borrowers who wish to consolidate debt or need a personal loan to pay for costly events, such as a wedding or moving home. As a peer-to-peer online platform, Peerform doesn’t actually fund the loans but instead connects borrowers to investors, who lend money with the goal of earning a return that beats the yields offered by other investments. Beyond simply connecting borrowers and lenders, Peerform assesses the risk of each borrower by looking at risk factors such as debt-to-income ratio, credit score, and prior payment delinquencies. As a platform that welcomes borrowers with lower credit scores – versus SoFi which exclusively targets super-prime borrowers – Peerform accepts a broader range of customers so, even if you have less than stellar credit, you stand a decent chance of being approved. Why Choose Peerform Personal Loans? What Are The Minimum Borrower Requirements? How Does Peerform Verify Borrowers? Whether borrowing to pay for a wedding or simply looking to consolidate debt, Peerform can help you access capital in 2 weeks or less, though don’t expect to pay rock bottom rates. If you are looking for a loan to pay for a wedding, medical expenses, or a car, Peerform can loan you anywhere from $4,000 → $25,000. Personal loans can be used for a wide variety of categories, including moving and relocation, home improvement, and debt consolidation. Because Peerform accepts customers with so-so credit who may be paying high interest rates elsewhere, debt consolidation is a popular choice to lower overall monthly interest costs. You can get a free quote quickly for a fixed rate loan that varies from 5.99% to 29.99% depending on your risk category, which will be anywhere from AAA to DDD. In the A-category, the lowest risk borrower is categorized as AAA, and the highest risk borrower is classified as A. The AAA borrower pays the lowest APR rate of 5.99% among all borrowers while the A borrower APR rate is 15.59%. In the B-category, the APR rate ranges from 17.13% to 23.77% while in the C-category the range is from 25.31% to 29.40%. Borrowers categorized as DDD pay the highest rate of 29.99%. Peerform conducts a thorough check on your finances to gauge what risk category you fall into and what interest you will pay. Your credit score, income and debt levels are among the primary indicators to assess risk. Peerform looks at a wide variety of financial metrics to assess borrower risk, including FICO Scores, debt levels, income, credit profile, and bank account information. You must have a minimum FICO Score of 600 in order to be eligible for a loan on the Peerform platform. Excluding mortgage debt, your debt-to-income ratio must be less than 40%. And Peerform will verify your income claims using two recent pay stubs as well as tax documentation. No minimum income level is demanded. Plus, you must have at least one open bank account and a minimum of one revolving account ever opened. When you apply for a loan, Peerform will verify your personal information to minimize the risk of fraud. After you submit your information, Peerform will verify that you are who you say you are using some standard checks. The idea is also to reduce fraud which is a big challenge lenders face. Peerform won’t charge you penalty fees for paying off your loan early though you will be dinged with fees for paying late and for unsuccessful payments. If you need money but don’t have great credit, Peerform is worth checking out. And if you have top notch credit, you may be eligible for low interest rate personal loans to pay for a wide variety of events, such as weddings, moving, or even a new car. ✅ Low Credit Score Applicants: If you were denied for a loan elsewhere, you may be eligible at Peerform provided your credit score is at least 600. ❌ Fees: You won’t be hit with early payment penalty fees but you will get hit with fees when paying late or if your payment is unsuccessful. ✅ Soft Credit Check: You can check your loan rate without it hurting your credit score because only a soft credit check is conducted. ❌ High Rates: Unless you fall into one of the top tier categories, your APR rate is likely to be quite hefty, though it may be lower than your credit card rates. ✅ Fast Application Process: Shopping for rates and loan approvals are both fast. Checking rates is almost immediate while getting approval can take anywhere from 3 → 14 days. ✅ Payment Postponement: You can inform Peerform that you need a little extra time to pay your loan and enjoy a grace period of up to 10 days as long as you notify them a few days before the payment is scheduled to be made. ✅ Consolidate Debt: If you are paying high interest rates elsewhere you can consolidate your debt into one potentially lower payment. ✅ Wide Variety Of Uses: Personal loans can be used to purchase a car, finance a move, pay for a wedding, consolidate debt, and wide variety of other uses. Peerform has a lot of advantages for people with poor credit. In return, though, you have to pay fairly high origination fees. Expect Peerform to charge 1% to 5%. If you borrow $10,000, you will have to pay between $100 and $500 on top of the loan’s interest. In most cases, borrowers with the best credit scores pay the lowest fees. Overall, Peerform works well for most people who have poor credit. If you have a high credit score, you should explore more options to make sure you get the lowest interest rate and origination feed. Peerform is a lending service that supports peer-to-peer loans. When you borrow money, you get cash from investors that work with the company. This approach to lending has its pros and cons, so you should explore your options before accepting a loan. For many people, though, Peerform offers the benefits that they need for loans between $4,000 and $35,000. The company excels at helping people consolidate debt. If you want a debt consolidation loan, you can borrow any amount between $10,000 and $35,000. It provides personal loans for amounts between $4,000 and $25,000. You don’t need excellent credit to qualify for a loan from Peerform. As long as you have a credit score of 600 or above, you may be eligible to get a Peerform loan. Many lenders only work with borrowers that have credit scores of 700 or above. If you have struggled to receive approval elsewhere Peerform may have a loan option that is right for you. Despite Peerform’s willingness to extend loan offers to people with low credit scores, it doesn’t force you to get a co-signer or put up collateral. Even if you have a 600+ credit score, you can borrow money without having someone co-sign your loan. You don’t even have to use your car or home as collateral. When you want to borrow money, you probably need access to the cash as soon as possible. Even if you want to consolidate credit card debt, it makes sense for you to get your loan quickly so you can avoid your credit card’s high interest rate. Peerform usually takes about a week to process your loan application and give you your money.